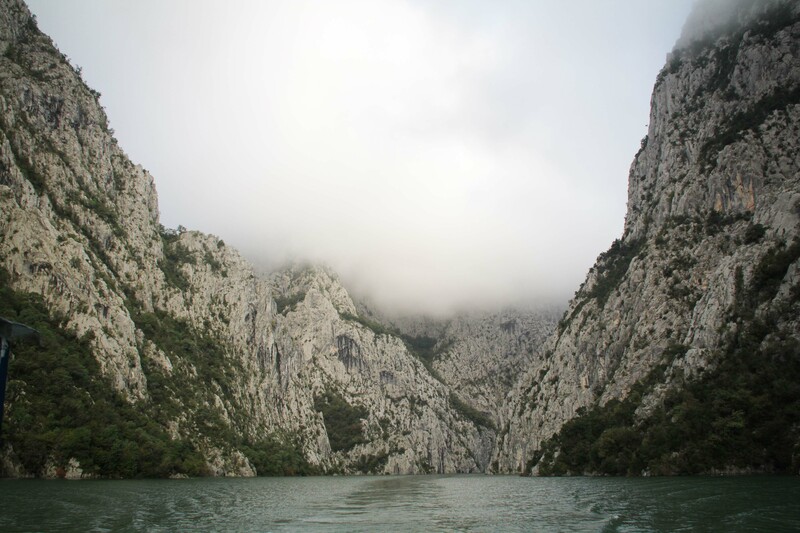 We had read about the ferry ride from Fierze to Koman that runs through a series of connected reservoirs on numerous websites. The issue was that they had all been written several years ago and we could find little information that was up to date or that we could consider 100% reliable. We had decided to cycle to Fierze in the hope that we could take this mythical, possibly non existent trip without daring to hope that it really did exist. So when we had arrived at the ferry terminal yesterday and were immediately asked if we were getting the ferry in the morning, we replied in the affirmative with a sigh of relief. Even better, the people in the small cafe at the ferry terminal were more than happy for us to pitch up camp wherever the fancy took us. And so we did. Camping under the watchful lights of two car ferries that have been moored up for several years now was a surreal experience, both have caretakers onboard, presumably in the hope that some day they will be called back in to service again. But for now they stand idle, two lonely spectres of what remains since new motorways have been built connecting the north of Albania to Tirana.The question that remained was: If these two hulking beasts aren’t running, where is our ferry? When we woke this morning, it was so dark and I was so comfy in my sleeping bag I just thought ‘Feck it, it can’t be that spectcular, it’s only a ferry ride’ and considered hitting snooze until a more reasonable hour. But we’d pedalled this far and so we reluctantly tore ourselves from our coccoon of comfort and into the 5am darkness. As we were packing our little home away, the ferry sputtered into life and left it’s little spot in the shadows of one of the car ferries. It was dwarved by it’s companion and in the darkness of the previous night I had mistaken it for a lifeboat. How wrong I was! As the people who would be in charge of the vessel we were about to board enjoyed a couple of rakijas before setting sail, we sipped espressos hoping that it might pump a little life into our weary veins. The other two passengers who would be joining us were a young girl and an old man, laden down with shopping and bags and obviously returning home after a shopping expidition to the nearest town. We were the strangest bunch of people I have ever witnessed boarding a vessel, like a weird version of Noahs Ark with us hopping on in pairs, me and Sam bringing up the rear with our bikes. 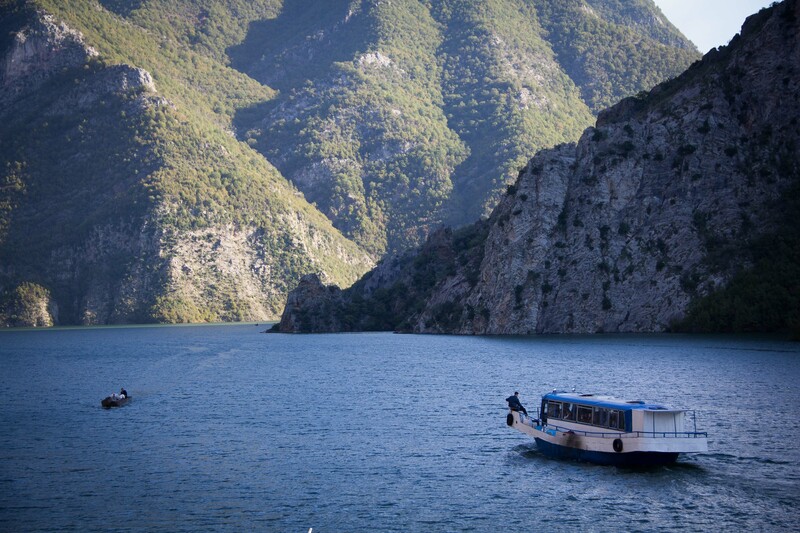 As our boat readied to set sail, a rowing boat was filling up with 6 or 7 teenagers at the shore of the lake. In they hopped, school bags on backs, with an elderly gentleman gently pulling on the oars at the front. Gently gliding over the lake in the calm early morning it was the most novel school run I have ever seen. We set off just as a tinge of light began to touch the horizon. Lamps glowed gently from the interior of the boat and Sam and I stood on the deck watching the light advance as we left Fierze behind. As we continued, we realised that our ferry was in fact half bus-half boat. In a show of ingenuity, someone had welded the top part of a bus on to, well, a kind of a massive bath tub. The “captain” sat in the bus drivers seat and used the same steering wheel that would have been used in it’s previous incarnation. The low mist around the lake as the night became dawn created an eerie atmosphere across the still lake. As we pulled up to our first stop, there was little indication of why we woud be pulling up here, but it became quickly apprent that this was where our two fellow passengers would be disembarking. And then it was just us and the two lads in charge of this operation. At this stage I started to worry about how this boat was even running if the sum of their business was 4 customers for a 3 hour boat ride. I needn’t have worried. As we pootled along, we suddenly changed our course in the direction of a thin whisp of smoke curling from the rocky, steep lakeside. Three more people hopped on and numerous sacks of goods were thrown aboard too. 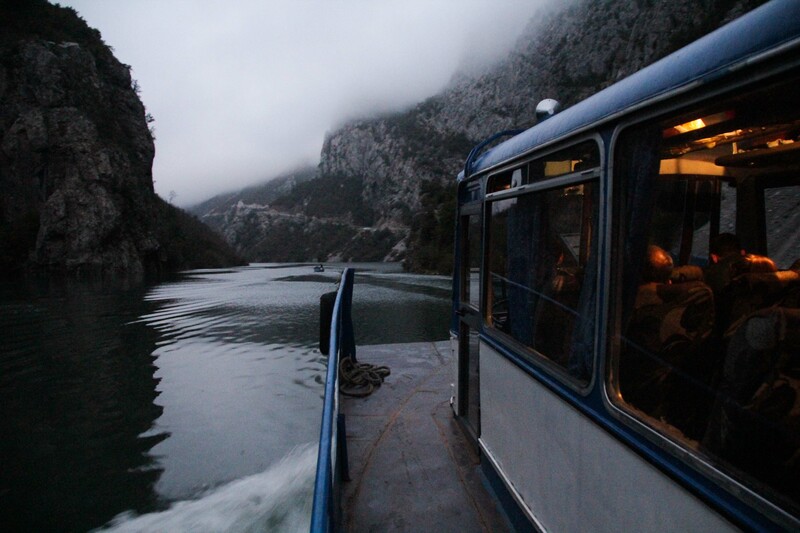 The remainder of our journey continued in this fashion, the ferry suddenly veering towards a smoke signal or a white rag being waved aloft a stick as a signal that there were more passengers or goods to pick up. As the sun began to disperse the low lying mist, the beauty of the mountains towering over the lake was revealed to us. Over a 1000m high in places, it gave a sense of the ethereal and for want of a better word, was genuinely awesome to see. The boat continued on sometimes towards seemingly impossibly narrow passes only to open up again revealing small hamlets who’s only access to the outside world is via this ferry. Sacks were loaded and unloaded, bargains struck at lightning quick pace on tiny piers before the ferry pulled out again, the women gossiped inside the coach and the men smoked on the deck. The series of lakes that we travelled on today are artificial. They were created in the 1970’s with a series of dams in order to povide hydroelectric power which is generated at our destination, Koman. The lakes are over 100m deep and at the time they were created, numerous homes and villages were destroyed in the name of progress. It is, however, undeniably, the most beautiful boat ride I have ever taken. My words are not adequate to describe the changing landscape over this three hour journey, I simply can’t do it the justice it deserves. The mountains are untouched with evidence of settlement sparse in what must be a harsh landscape to eke out a living in. The water is a vibrant green and the white rock of the valley sides towers above the lakes, apparently defying gravity. As we neared the pier at Koman, it was clear that a large crowd was gathered in anticipation of our arrival. Obviously not my arrival, but that of the ferry. The haggling over prices that would be fetched for sacks of corn and nuts and god knows what else had begun before our ferry had ground to a halt. Weighing scales were pulled out, deals settled, hands shaken and money had changed hands all in the 10 minutes it took to unload all it’s cargo and passengers and reload to do the return journey. 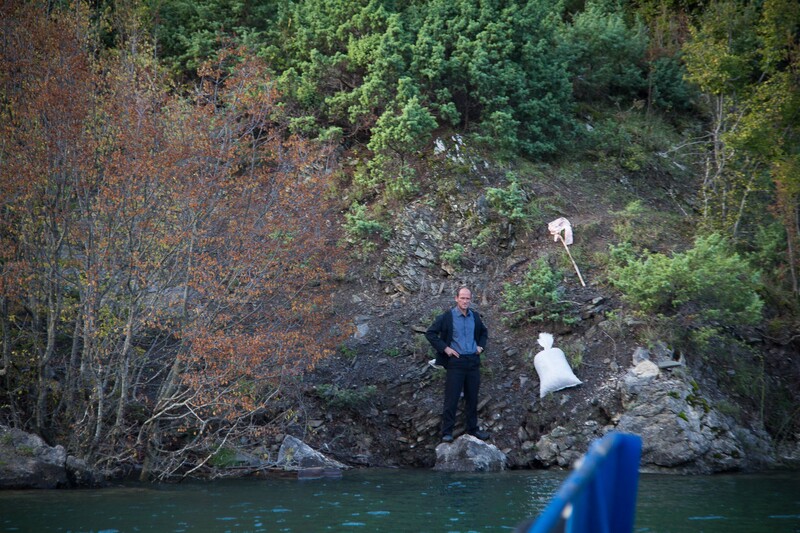 And just like that, our bus-boat turned tail and headed off around a small crack in the rock. We sipped at coffee as we watched it disappear around a corner, both Sam and I lost in thought at the breath taking journey we had just been on. And it was only 9 o’ clock! 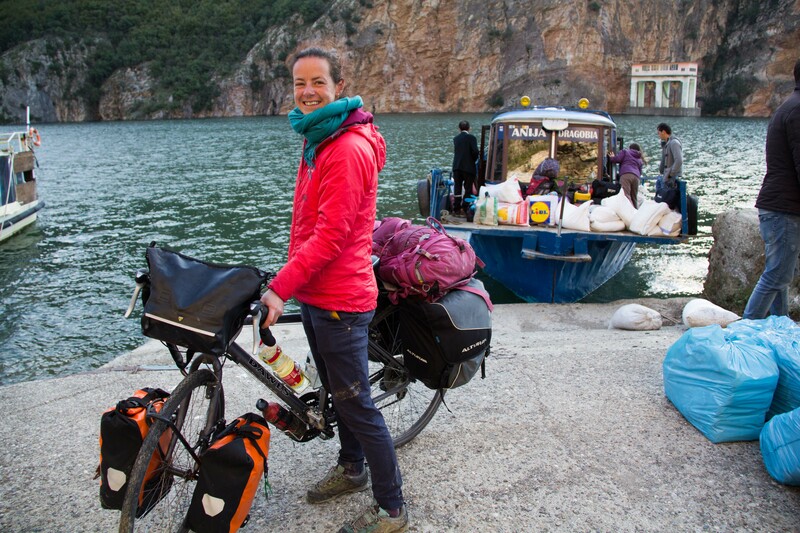 The ferry “terminal” is located before the dam which has created this manmade lake, and so to reach the village of Koman on the other side we had to cycle through a long, but fortunately lit, tunnel through the mountain. Emerging into the sunlight on the other side presented us with an image of the industry that created the landscape making the ferry ride not only possible but also a necessity. Dozens of trucks zipped up and down the dam, moving massive quantities of earth from one place to another place for apparently no reason. And a stern looking policeman oversaw it all from the top with a gun slung over his shoulder. Far below us, the hydroelectric plant stood, with some parts seemingly crumbling away into the river. We struggled down a dusty road that we shared with many more earth moving trucks. We were starving and absolutely shattered after a combination of a ridiculously early start and our 3 hours of excitement aboard the boat. As we came into the village, we saw a sign for a restaurant and although it was still mid morning, our bodies were pretty convinced it was lunchtime so I tucked into a bowl of hearty goulash while Sam ate his fill of rice and cheese (seriously, who came up with that?). The restaurant is also a campsite and hotel and is very strangely built on the underside of a bridge. As you sit in the restaurant you can hear trucks rumbling across the ceiling and the bridge supports are part of the kitchen walls inside, and I gotta say, I kinda like it! With our meal over with, we headed over the bridge/restaurant and began to head out of town. By his time, the midday sun was blazing overhead and our early start was really beginning to take it’s toll. But really, I’m just making excuses…… we turned back and plopped ourselves at the campsite where we chilled out in the sun, got some much needed laundry done and in the afternoon had a wander round to look at the hydroelectic plant in all it’s grandeur. There’s a huge amount of work going on here, but all without any apparent goal. Trucks trundle down to the river, are filled with rocks and sand and then trundle back up the mountain side where the load is deposited, it is then pushed over the edge by a digger and then there’s another guy movingit around again at the bottom. From what I can see, it almost seems to be industry just for the sake of industry. The truck drivers seem quite bored and one of them has taken a shine to Sam, giving him a massive wave every time he sees us (approximately every 20 minutes) and even insisted that Sam take his photo earlier! A walk around the village shows us that much of the previous construction here is crumbling round the edges with the rubble remains of many concrete homes and buildings evident. We’ve had a massively eventful day, hopping on a ferry with a night sky still overhead, passing through the extreme beauty of the Lake Komani Ferry ride and finishing in a town overshadowed by the behemoth construction of a dam. I think I need a beer! There is an alternative tourist boat that runs in the summer. It is 5 euro from Koman to Fierze, leaves at 9am. It returns at 1pm via a village along the way. The leg from Fierze to Koman costs 10 euro on the tourist boat. The campsite at Koman is called Bar Restaurant “Natura” and is 2 euro for a tent, 1 euro for a bicycle, 2 euro for a motorcyce. It’s a clean place, the restaurant serves good food and the showers are hot! ← The Top 10 Things To Do in Sarajevo- A list of what you must see! This is 100% more about Albania than I knew before. After looking up these places on maps I am discovering many amazing things to inspire my own trip to eastern Europe. I am enjoying following along on your journey, thanks for sharing. Cheers! Great blog post, thanks! We just arrived in Albania (travelling by motorhome called Blac) and are planning to do this trip, and your post has more info than what I’ve found elsewhere. We’ll need to do it as a return trip to get back to Blac and prior to reading your post we’d have tried to start at the wrong end. Ali.